Mexico’s Interjet has asked Russian partners to help the airline return to service its entire Superjet fleet and do so in the form of an investment re-payable from revenues the 22 aircraft would generate on passenger services. As of early April, only seven Interjet SSJ100s remained airworthy. 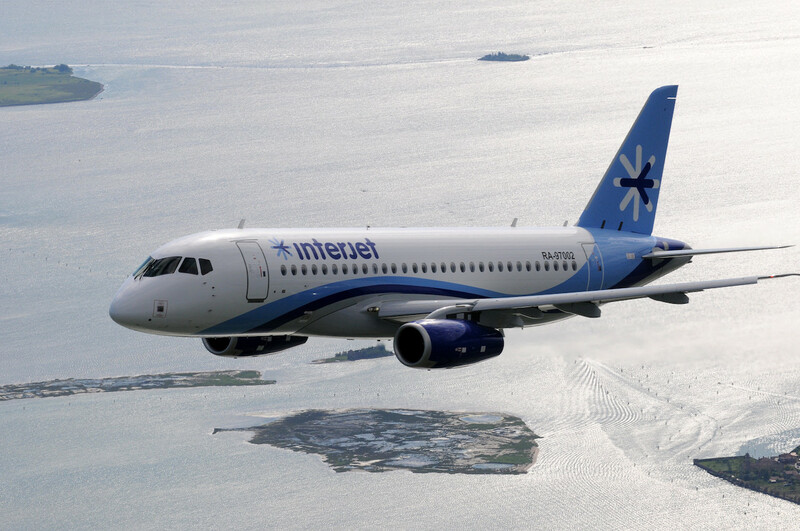 The proposal emerged out of a recent meeting between Interjet’s new management team and a Russian delegation including Alexander Roubtsov and Ravil Khakimov, the former and incumbent president of Sukhoi Civil Aircraft Company (SCAC), respectively. The two sides agreed to act “in a concerted manner” to ensure all 22 SSJ100s the airline acquired since 2012 can fly in revenue service. Interjet has asked the Russians to provide operable engines or repair the existing ones in “the shortest time possible” to restore 15 Superjets that now sit idle. SCAC and United Engine Corporation (ODK) have begun formulating a plan to give Interjet several SaM.146 engines from ODK’s replacement stock created last year to support SSJ100 operators low on cash. The stock now accounts for about 20 engines available for lease to SSJ100 operators in case they experience an engine failure. The two manufacturers have urged Powerjet and French partner Safran to arrange “favorable conditions” for Interjet when the airline needs to repair SAM.146s. They also plan to work with Russia’s Ministry for Industry and Trade to arrange a new credit line for the ailing Superjet operator. Apparently, the recent changes in Interjet’s top management—William Shaw replaced Jose Luis Garcia as CEO earlier this year—saw a U-turn in the carrier’s attitude toward the Superjet issues. The former team wanted to withdraw 15 older SSJ100s from the fleet and outfit seven recent airframes with “Saberlets”—radically curved wingtips designed to improve runway performance, reduce fuel burn by 4 percent, and give the type 270 to 380 nm of extra range when operating from short runways or high-elevation airports. They also wanted to take eight more Saberlet-equipped airplanes new from the factory. As the situation stands now, Interjet no longer wants any new SSJ100s and would rather focus financial resources on airframes it already received and whose airworthiness can be restored in the shortest time possible. According to Mexican press reports, Interjet has amassed debts exceeding $150 million, which makes it difficult for the airline to pay for rentals and maintenance. The carrier traces its financial troubles to the low exchange rate of the Mexican peso to hard currencies, in effect increasing the cost of financing imported aircraft from ticket sales in the airline’s home market.